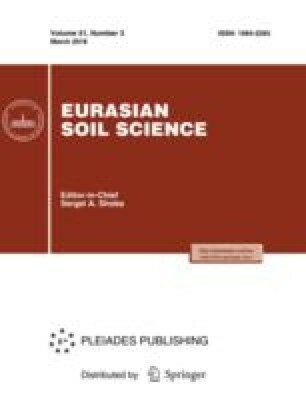 The influence of different systems of fertilization and liming on the changes in the taxonomic structure of prokaryotic community in arable soddy-podzolic soil (Albic Retisol (Loamic, Aric, Cutanic, Differentic, Ochric)) was studied in a stationary field experiment of Vologda State Dairy Farming Academy with the use of high-performance sequencing method of gene 16S rRNA. The 25-year-old fallow plot, in which the intensity of microbiological processes was close to that in the virgin soddy-podzolic soils, was used as a control. At the first stage, dominant phyla were identified: Proteobacteria (45.3–56.2%), Actinobacteria (13.6–20.4%), Bacteroidetes (7.2–19.3%), Acidobacteria (7.1–11.5%), and Verrucomicrobia (4.3–10.3%). Several groups of microorganisms-indicators, whose portion changes in the arable soil under the influence of liming, fertilizer application, and soil treatment in comparison with the control, were determined. The applied approach made it possible to relate the taxonomic structure of the soil microbial cenosis with external factors for assessing changes in the structure of soil microbial complex under the impact of different uses of the arable soil. Original Russian Text © A.N. Naliukhin, S.M. Khamitova, A.P. Glinushkin, Yu.M. Avdeev, V.S. Snetilova, Yu.V. Laktionov, V.V. Surov, O.V. Siluyanova, D.A. Belozerov, 2018, published in Pochvovedenie, 2018, No. 3, pp. 331–337.